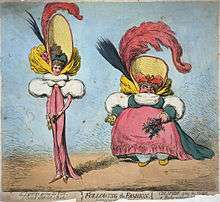 In Following the Fashion (1794), James Gillray caricatured a figure flattered by the short-bodiced gowns then in fashion, contrasting it with an imitator whose figure is not flattered. Early Western travelers, traveling whether to Persia, Turkey, India, or China, would frequently remark on the absence of change in fashion in the respective places. The Japanese Shogun's secretary bragged (not completely accurately) to a Spanish visitor in 1609 that Japanese clothing had not changed in over a thousand years. However, there is considerable evidence in Ming China of rapidly changing fashions in Chinese clothing. Changes in costume often took place at times of economic or social change, as occurred in ancient Rome and the medieval Caliphate, followed by a long period without major changes. In 8th-century Moorish Spain, the musician Ziryab introduced to Córdoba sophisticated clothing-styles based on seasonal and daily fashions from his native Baghdad, modified by his own inspiration. Similar changes in fashion occurred in the 11th century in the Middle East following the arrival of the Turks, who introduced clothing styles from Central Asia and the Far East. The beginning in Europe of continual and increasingly rapid change in clothing styles can be fairly reliably dated. Historians, including James Laver and Fernand Braudel, date the start of Western fashion in clothing to the middle of the 14th century, though it should be noted that they tend to rely heavily on contemporary imagery and illuminated manuscripts were not common before the fourteenth century. The most dramatic early change in fashion was a sudden drastic shortening and tightening of the male over-garment from calf-length to barely covering the buttocks, sometimes accompanied with stuffing in the chest to make it look bigger. This created the distinctive Western outline of a tailored top worn over leggings or trousers. Though textile colors and patterns changed from year to year, the cut of a gentleman's coat and the length of his waistcoat, or the pattern to which a lady's dress was cut, changed more slowly. Men's fashions were largely derived from military models, and changes in a European male Silhouette were galvanized in theaters of European war where gentleman officers had opportunities to make notes of foreign styles such as the "Steinkirk" cravat or necktie. The notion of a global fashion industry is a product of the modern age. Prior to the mid-19th century, most clothing was custom-made. It was handmade for individuals, either as home production or on order from dressmakers and tailors. By the beginning of the 20th century—with the rise of new technologies such as the sewing machine, the rise of global capitalism and the development of the factory system of production, and the proliferation of retail outlets such as department stores—clothing had increasingly come to be mass-produced in standard sizes and sold at fixed prices. Fashion trends are influenced by several factors including political, economical, social and technological. Examining these factors is called a PEST analysis. Fashion forecasters can use this information to help determine growth or decline of a particular trend. Political culture plays a critical role in fashion industry. Political change is reflection of today's fashion. Most of the political events and laws are affecting fashion in a way of creating fashion trend. Considering the relationship between fashion and politics, we can see how fashion is not only a matter of aesthetic but it involves politics as well. Within political references, we can see how fashion can change. Fashion is a reflection of current or historical events therefore it associates with today and past ‘s politics. For example, the terrorist attacks happened in the United States on September 11, 2001; it was the most tragic political events of the society. This catastrophic event caused horrific consequences which related to political. In a way, fashion trends were also revolutionised. It is hard to say that 9/11 attacks made a direct influence on fashion industry, it should not be considered as inspiration for fashion designer to forecast the trend. However, after 9/11, fashion designers decided to embrace this challenge and tried to convey the significant lost and depression into a form of fashion trend. In a way, they believe that nation would remember this event more often and cherish every single moment we have. Post 9/11 led comfort dressing to remember and grieve the attacks on 9/11. By doing so, this trend became a form of communication. 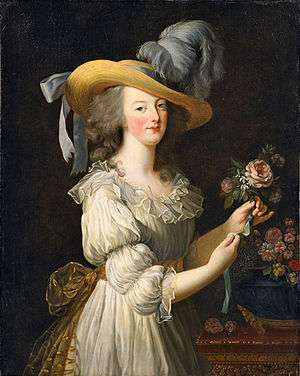 Furthermore, political revolution also made impact on fashion trend. For example, during the 1960s the economy had become wealthier, divorce rate was increasing and government approved the birth control pill. This revolution inspired younger generation to rebellion. In 1964, the leg-baring miniskirt has become a major fashion trend of the 1960s. Given that fashion designers began to experiment with the shapes of garment, loose sleeveless, micro-minis, flared skirts, and trumpet sleeves. In this case, mini-skirt trend became an icon of the 1960s. Developments such as wearable technology has become an important trend in fashion and will continue with advances such as clothing constructed with solar panels that charge devices and smart fabrics that enhance wearer comfort by changing color or texture based on environmental changes. Internet technology such as online retailers and social media platforms have given way for trends to be identified, marketed and sold immediately. Styles and trends are easily conveyed online to attract the trendsetters. Posts on Instagram or Facebook can easily increase awareness about new trends in fashion which can create high demand for specific items or brands, new "buy now button" technology can link these styles with direct sales. A company called Hyperstealth has said to have created a technology that can make an object or person invisible. "Quantum Stealth" is a light bending technology and can mask thermal and infrared signs. The company has continued developing this technology, but due to safety and legal concerns minimal information has been released to the public. This technology will not be quickly introduced into the commercial market, but the companies other projects such as non-powered color changing camouflage materials may be. Additional projects such as using interactive or intelligent technology sources that will be embedding into textiles will adjust to surroundings such as weather. As these developments proceed, consumers may see a more modern and technical way of wearing camouflage. These are just a few technological developments that have begun to influence fashion trends. Fashion trend is influenced by different factors and incidents happening in our environment. Art, music, and popular culture influence fashion trend and how its penetrate into our everyday lives. High end fashion is more creative, while high street fashion is more commercial. However, both high end and high street fashion reflect trends that are happening in our society as a whole. Fashion trends are both aesthetic and expressive values that showcase our personal statement. The relationship between the body and fashion is central to promoting particular values about the self to society. People use fashion as a way of assigning themselves into different values held by a particular group of people within a given society. Fashion trend goes beyond the aesthetic values, it emerges as an expressive tool for designers to deliver their message about the society. With the influence of social media, celebrities and bloggers, their voice are easily being heard and have impact on fashion and trend at any time. Fashion and music are inseparable. Prabal Gurung  highlighted the importance of music to his shows, saying "each season we want to tell a story for 10 minutes…. the perfect harmony between cloths and music allows this". Music is a representation of fashion that expresses the abstract design concept into relatable harmony for viewers. H&M work with the Coachella Valley Music and Arts Festival to develop a clothing collection. From the success of its first collaboration at 2015, which gives confidence for the brand to continuous launch this collection again this year. At Coachella, fashion and music express an energy that belongs to the festival and music goers. The collective trend and style that symbolize the energy and personality. "Less is more." is the main idea of minimalist fashion. Minimalism is a philosophy of dressing that has endured for decades, and is probably best recognized today by the general public through the fashion houses of Jil Sander, Balenciaga, and Calvin Klein. Calvin Klein really has captured the minimalist movement in America during the 1990s. While the clothes are simple and have a reduction on color pallet, there is a very sexual and grunge feel to his designs. Simple, function, and original are the key components to describe minimalism. Clean lines, functionality have always been hallmarks of the style. It depends as the mainstream fashion of 90s, Calvin Klein is a well-known examples for minimalistic style. They create easy clothes for modern women which use executed cut to emphasize shape and neutral color are the major color tone. 90s fashion has re-emerged the black and white palette prevalently as a defining duo on today's runways. The all-white look is another 90s favorite look which is impacting a rise in neutrals in today's fashion as well. Minimalism is also a catalyst for the rise of activewear influences. This trend introduces the bandeau and sports bra tops, bomber jackets and racerback details in high fashion collections during that era and it returns to runways and streets today. Sheer is a key material during the minimalist movement. It emerges in a wide range of applications, from an overlay to a full garment. The trend for transparency keeps to continue as a focus of designer collections every since then. Besides sheer fabrics, metallic materials also bring the interest to the sparse shapes of the era. It is a trend that reflects in the rave culture and bridging the grunge musician and the fans. Reflective has returned on recent runway and also on current streets with a range of metal. Crop top is the most democratic garment that connecting the movements of minimalist, grunge, hip-hop and R&B culture and turning up on everyone from Mariah Carey and Spice Girls to the top fashion icons. Another defining looks to emerge from minimalist era is the idea of underwear as outerwear. Camisoles and slip dresses were introduced to the market and it became a quintessential of the 90s in contemporary fashion. Minimalism style is much more than a trend, it becomes a zeitgeist. Designers such as Stella McCartney follows the suit with pragmatic tailoring in neutral palettes, Alexander Wang starts to show pared-down activewear in black, white and grey. Even Victoria Beckham turns to strict silhouettes from the bling wave. Minimalism never goes away. Shapes are plain, femininity is the leader, Color and sculpted shapes speak louder than extra decorative accessories. As we undergo a global economic downturn, the "Spend now, think later" belief is getting less relevant in our society. Today's consumer tends to be more mindful about consumption, looking for just enough and better, more durable options. People have also become more conscious of the impact their everyday consumption has on the environment and society. They're looking for ways to mediate their material desires with an aim to do more good in the world. A linear economy is slowly shifting to a circular one. In fashion trends and forecasting, consumer is king. What does a consumer really want? Understanding the consumer is a vital part of the fashion world, without them products cannot be sold. First, it is important to note the difference between a consumer's needs and a consumer's wants. A need of a consumer is a desire to obtain a product or service, that is either for an emotional or functional reason. A ‘want’ differs from a consumer's ‘need’ by the consumer's desire to have a product or service that is not necessary, the consumer just wishes they had it. The success of a fashion company and the prediction of future trends is dependent on addressing its consumers’ needs. Often consumers need to be told what they want. Fashion companies have to do their research to ensure they know its customers’ needs before developing solutions. Steve Jobs said, "You’ve got to start with the customer experience and work backwards to the technology. You cannot start with the technology and try to figure out where you are going to sell it". The media plays a significant role when it comes to fashion. For instance, an important part of fashion is fashion journalism. Editorial critique, guidelines, and commentary can be found on television and in magazines, newspapers, fashion websites, Social network, and fashion blogs. In recent years, fashion blogging and YouTube videos have become a major outlet for spreading trends and fashion tips, creating an online culture of sharing one's style on a website or Instagram account. Through these media outlets readers and viewers all over the world can learn about fashion, making it very accessible. However, over the past several years, fashion websites have developed that merge traditional editorial writing with user-generated content. Online magazines like iFashion Network and Runway Magazine, led by Nole Marin from America's Next Top Model, have begun to dominate the market with digital copies for computers, iPhones, and iPads. Example platforms include Apple and Android for such applications. Building brand awareness and credibility is a key implication of good public relations. In some cases, great hype is built about new designers' collections before they are released into the market, due to the immense exposure generated by practitioners. Social media, such as blogs, micro blogs, podcasts, photo and video sharing sites have all become increasingly important to fashion public relations. The interactive nature of these platforms allows practitioners to engage and communicate with publics in real time, and tailor their clients’ brand or campaign messages to the target audience. With blogging platforms such as Instagram, Tumblr, Wordpress, and other sharing sites, bloggers have emerged as expert fashion commentators, shaping brands and having a great impact on what is ‘on trend’. Women in the fashion public relations industry such as Sweaty Betty PR founder Roxy Jacenko and Oscar de la Renta's PR girl Erika Bearman, have acquired copious amounts of followers on their social media sites, by providing a brand identity and a behind the scenes look into the companies they work for. Today, people in rich countries are linked to people in poor countries through the commoditization and consumption of what is called fashion. People work long hours in one area of the globe to produce things that people in another part of the globe are anxious to consume. An example of this is the chain of production and consumption of Nike shoes, which are produced in Taiwan and then purchased in North America. At the production end, there is nation-building a hard working ideology that leads people to produce and entices people to consume with a vast amount of goods for the offering. Commodities are no longer just utilitarian but are fashionable, be they running shoes or sweat suits. In the fashion industry, intellectual property is not enforced as it is within the film industry and music industry. Robert Glariston, an intellectual property expert, mentioned in a fashion seminar held in LA that "Copyright law regarding clothing is a current hot-button issue in the industry. We often have to draw the line between designers being inspired by a design and those outright stealing it in different places." To take inspiration from others' designs contributes to the fashion industry's ability to establish clothing trends. For the past few years, WGSN has been a dominant source of fashion news and forecasts in encouraging fashion brands worldwide to be inspired by one another. Enticing consumers to buy clothing by establishing new trends is, some have argued, a key component of the industry's success. Intellectual property rules that interfere with this process of trend-making would, in this view, be counter-productive. On the other hand, it is often argued that the blatant theft of new ideas, unique designs, and design details by larger companies is what often contributes to the failure of many smaller or independent design companies. One up-and-coming fashion cause is trashion, which is using trash to make clothes, jewelery, and other fashion items in order to promote awareness of pollution. There are a number of modern trashion artists such as Marina DeBris, Ann Wizer, and Nancy Judd. Fashion has come a long way and the fashion industry has been broadened to include cultural fashions as well as different platforms for designers to showcase their work. Indigenous Fashion Week in Australia, for example, has been created and introduced to the public as a way for indigenous designers to embrace their cultural and traditional clothing and create new trends in fashion to share with the world. Wikimedia Commons has media related to Fashion. ↑ Fashion (2012, March 29). Wwd. (n.d.). Retrieved from http://www.wwd.com/fashion-news. ↑ Timothy Brook: "The Confusions of Pleasure: Commerce and Culture in Ming China" (University of California Press 1999); this has a whole section on fashion. ↑ Terrasse, H. (1958) 'Islam d'Espagne' une rencontre de l'Orient et de l'Occident", Librairie Plon, Paris, pp.52–53. ↑ Josef W. Meri & Jere L. Bacharach (2006). Medieval Islamic Civilization: A–K. Taylor & Francis. p. 162. ISBN 0415966914. ↑ Heller, Sarah-Grace (2007). 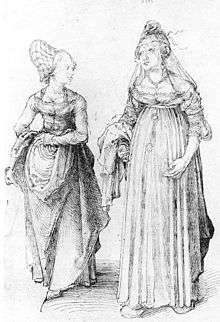 Fashion in Medieval France. Cambridge; Rochester, N.Y.: Boydell and Brewer. pp. 49–50. ISBN 9781843841104. 1 2 "Jeans Calças Modelos Ideais". Conceito M. 19 November 2014. Retrieved 26 April 2015. ↑ Thornton, Peter. Baroque and Rococo Silks. ↑ Ribeiro, Aileen (2003). Dress and Morality. Berg. pp. 116–117. ISBN 9781859737828. ↑ Parkins, Ilya (2013). "Introduction: Reputation, Celebrity and the "Professional" Designer". Poiret, Dior and Schiaparelli: Fashion, Femininity and Modernity. (English ed.). London: Bloomsbury Publishing. p. 10. ISBN 9780857853288. ↑ Lemire, B., & Riello, G (2008). EAST & WEST: TEXTILES AND FASHION IN EARLY MODERN EUROPE. Journal of Social History, 41(4), 887–916. ↑ "How Bargain Fashion Chains Will Keep Themselves Cut-Rate -- New York Magazine". NYMag.com. Retrieved 26 April 2015. ↑ "Political & Economic Factors That Influenced Fashion in the 1960s | The Classroom | Synonym". classroom.synonym.com. Retrieved 2016-05-30. ↑ Communications, Edgell. "Top 6 Tech Trends in the Fashion Industry". apparel.edgl.com. Retrieved 2016-03-10. ↑ "The Impact of Technology on Fashion Today". Site Name. Retrieved 2016-03-10. ↑ "How Machine Vision Is About to Change the Fashion World". MIT Technology Review. Retrieved 2016-03-10. ↑ "Home : Berg Fashion Library". www.bergfashionlibrary.com. Retrieved 2016-03-10. ↑ "The Future Of Stealth Camouflage In Special Operations". Business Insider. Retrieved 2016-03-10. ↑ "Music and Fashion". www.notjustalabel.com. Retrieved 2016-03-07. ↑ "Does pop culture influence fashion?". www.sundaynews.co.zw. Retrieved 2016-03-07. ↑ Carlos, Marjon. "The Fashion in Beyoncé's New Video Is as Powerful as Its Politics". Vogue. Retrieved 2016-03-07. 1 2 Dazed. "Vivienne Westwood's top ten political moments". Dazed. Retrieved 2016-03-07. 1 2 3 Vaughn/Berelowitz, Jessica/Marian (2015). "The circular economy". Warc. 1 2 Ap, Tiffany (November 2015). "China Makes Moves to Boost Consumption". Women's Wear Daily. ↑ Kaiser, Amanda (14 March 2016). "Tokyo Fashion Week Starts in Challenging Economy". Women's Wear Daily. ↑ Boundless (2016-05-26). "Customer Wants and Needs". ↑ "Consumer Needs & Marketing". smallbusiness.chron.com. Retrieved 2016-05-30. ↑ "Strategyn". Strategyn. Retrieved 2016-05-30. 1 2 "Consumer Research Methods". www.consumerpsychologist.com. Retrieved 2016-05-30. ↑ "Fashion Websites like Nytime's Men's Style". New York Times. ↑ Tax, Genevieve. (2010-02-24) Fashion's Own Sense of Season. The New Islander. Retrieved on 2011-06-29. ↑ Thompson, S.B.N., Hussein, Y., Jones, N. Designing for the famous – psychology of building a brand in haute couture shoe design and fashion. Design Principles & Practices: An International Journal 2011;5(5):1–25. ↑ Sherman, G., & Perlman, S. (2010). Fashion public relations. New York: Fairchild Books. In Cassidy, L. & Fitch, K. (2013) Beyond the Catwalk: Fashion Public Relations and Social Media in Australia, Asia Pacific Public Relations Journal, vol. 14, No. 1 & 2, Murdoch University. ↑ Westfield, A. M. (2002) The Role of Public Relations in Redefining Brands in the Fashion Industry, University of Southern California, Los Angeles, California. ↑ Experian. (2012). Getting the most from social: An integrated marketing approach. Retrieved from www.experian.com.au/assets/social/getting-the-most-from-social.pdf in Cassidy, L. & Fitch, K. (2013) Beyond the Catwalk: Fashion Public Relations and Social Media in Australia, Asia Pacific Public Relations Journal, vol. 14, No. 1 & 2, Murdoch University. ↑ Dalto, A. (2010, September). Brands tempt female bloggers with ‘swag’. O’Dwyer's Communications and New Media: The Fashion Issue, 24(9), 12–13. Retrieved from http://www.odwyerpr.com/profiles/O%27Dwyer%27s%20Magazine%20-%20Sep.%202010.pdf in Cassidy, L. & Fitch, K. (2013) Beyond the Catwalk: Fashion Public Relations and Social Media in Australia, Asia Pacific Public Relations Journal, vol. 14, No. 1 & 2, Murdoch University. ↑ Noricks, C. (2006). From style to strategy: An exploratory investigation of public relations practice in the fashion industry. Unpublished master's thesis, San Diego State University, San Diego, CA. in Cassidy, L. & Fitch, K. (2013) Beyond the Catwalk: Fashion Public Relations and Social Media in Australia, Asia Pacific Public Relations Journal, vol. 14, No. 1 & 2, Murdoch University. ↑ Wright, M. (2011). How premium fashion brands are maximising their social media ROI. Mashable. Retrieved from www.mashable.com/2011/02/11/fashion-brands-social-media-roi/ in Cassidy, L. & Fitch, K. (2013) Beyond the Catwalk: Fashion Public Relations and Social Media in Australia, Asia Pacific Public Relations Journal, vol. 14, No. 1 & 2, Murdoch University. ↑ Molnar, Andrea K (1998). Transformations in the Use of Traditional Textiles of Ngada (Western Flores, Eastern Indonesia): Commercialization, Fashion and Ethnicity. Consuming Fashion: Adorning the Transnational Body: Berg. pp. 39–55 . ↑ Polhemus and Procter, Ted and Lynn (1978). Fashion and Anti-fashion: An Anthropology of Clothing and Adornment. Thames and Hudson. p. 12. ↑ Polhemus and Procter, Ted and Lynn (1978). Fashion and Anti-fashion: An Anthropology of Clothing and Adornment. Thames and Hudson. pp. 12–13. ↑ Skoggard, Ian (1998). Transnational Commodity Flows and the Global Phenomenon of the Brand. Consuming Fashion: Adorning the Transnational Body: Berg. pp. 57–69. ↑ Molnar, Andrea K (1998). Transformations in the Use of Traditional Textiles of Ngada (Western Flores, Eastern Indonesia): Commercialization, Fashion and Ethnicity. Consuming Fashion: Adorning the Transnational Body: Berg. pp. 39–43. ↑ Molnar, Andrea K (1998). Transformations in the Use of Traditional Textiles of Ngada (Western Flores, Eastern Indonesia): Commercialization, Fashion and Ethnicity. Consuming Fashion: Adorning the Transnational Body: Berg. p. 41 and 45–48. ↑ Molnar, Andrea K (1998). Transformations in the Use of Traditional Textiles of Ngada (Western Flores, Eastern Indonesia): Commercialization, Fashion and Ethnicity. Consuming Fashion: Adorning the Transnationa: Berg. ↑ "Fashion For A Cause". Times of India. 2013-02-04. Retrieved 2013-02-15. ↑ Woodman, Anne (2013-01-26). "Fashion for a cause". Clayton News Star. Retrieved 2013-02-15. ↑ "Fashion for a cause". Chatham Daily News. 2013-02-07. Retrieved 2013-02-15. ↑ luc, karie angell (2013-01-16). "'Fashion for a Cause' aids families and kids". Northbrook Star. Retrieved 2013-02-15. ↑ "Fashion for a cause". Capital Gazette. Retrieved 2013-02-15. ↑ "One man's trash is another man's fashion". NBC News/ AP. 2008-07-02. Retrieved 2013-02-15. ↑ Simon, Stephanie (2009-01-13). "'Trashion' Trend: Dumpster Couture Gets a Boost at Green Inaugural Ball". Wall Street Journal. Retrieved 2013-02-15.